The Pineapple Express i Pushkar, Indien: Reservér nu! 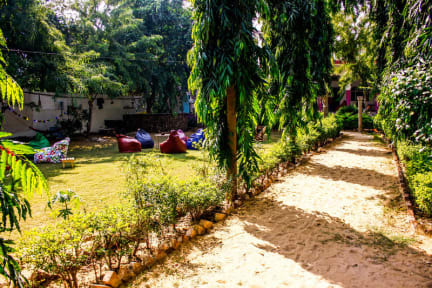 The Pineapple Express is the place to be in Pushkar. Coming into our second year of life with Martin as the motorman, he has created an always growing family in the hostel. All our team came as guest and have stayed many One More Nights, we promise we are that great! Our home is located in a non-noise safe area, 5 minutes walking from Gurudwara temple and few minutes more to the center of the market and magic lake. We love our green garden oasis, full of life and stories, with bonfires nights to warm you in winter and refreshing lassis in the pool in summer. 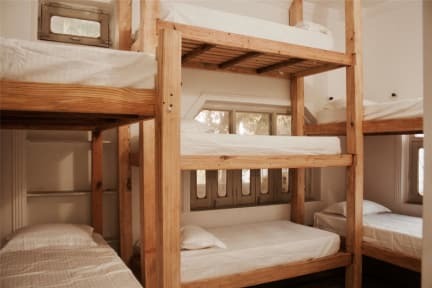 Come and have fun meeting other travelers, play with our adorable dogs, drink as many lassis as your body needs and have some relax naps in the hammocks or peaceful sleep in our awesome mattresses.